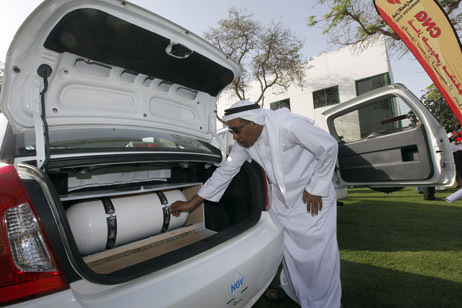 Dubai’s Director Of Transportation is among the first recipients of a compressed gas engine vehicle. Starting with just five vehicles initially, the Dubai municipality plans to eventually outfit 500 vehicles with compressed gas engines with technical assistance from Compressed Gas Technology (CG Tech), The National reports. By burning a combination of petrol and natural gas, these cars will radically decrease emissions. Although the UAE has the seventh largest supply of natural gas in the world, the extraction industry does have its share of challenges, nor is natural gas a renewable resource. Even so, concerted worldwide efforts to reduce carbon emissions will go a long way to at least slowing down what Thomas Friedman calls “Global Weirding” in his landmark book Hot, Flat, and Crowded. Dubai is the first Emirati government to test these hybrid vehicles, which will reduce emissions up to 70%. According to the Director General of the municipality, if 400 vehicles are converted, it could result in savings of $630,000. After the initial testing phase, the government will convert a further 500 vehicles locally. 200 non-government vehicles have already been converted throughout the Emirates. The conversion kits are imported from Europe and cost approximately $2,000 or more depending on the engine size, according to CG Tech’s project engineer Sarun Viswanathan. In time, however, the company hopes to be able to manufacture their own kits and thereby reduce costs. In order to supply the fuel for these vehicles, Hesham Ali Mustafa, the general manager of Emirates Gas, told the paper of its plans to build a CNG refill facility at service stations. The US Energy Information Administration notes that while the UAE has significant natural gas supplies – roughly 214.4 trillion cubic feet, their supply has a high sulphur content that makes production difficult. Also, in 2007, local consumption outstripped production, demonstrating that theirs is by no means a fail-safe energy source. The National reported that Nassir Arzamkam, a partner of the company Air Engine that has reportedly developed the first compressed air engine, notes that while the compressed gas engines comprise an important step forward, they aren’t sustainable in the long-term since they still pollute. First green car rental company started in Dubai. kindly visit http://www.greencardubai.com for more detials.